In 1939, newly created British intelligence agency MI6 recruits Cambridge mathematics alumnus Alan Turing (Benedict Cumberbatch) to crack Nazi codes, including Enigma—which cryptanalysts had thought unbreakable. Turing’s team, including Joan Clarke (Keira Knightley), analyse Enigma messages while he builds a machine to decipher them. Turing and team finally succeed and become heroes, but in 1952, the quiet genius encounters disgrace when authorities reveal he is gay and send him to prison. The Imitation Game is such an awesome film! Truly. No wonder the film won the Oscar for Best Adapted Screenplay in 2015. The film is really great. The story behind it just unbelievable. However, I am sorry Benedict Cumberbatch didn’t win the Oscar nor the Golden Globe. Not because he isn’t a good actor, believe me, he is a great actor, a very outstanding actor. Unfortunately, Cumberbatch’s competitor was Eddie Redmayne and his acting in The Theory of Everything (2014) was just too unbeatable, too great, too awesome, and too incredible. No wonder he won the Oscar for Best Performance by an Actor in a Leading Role. Being Stephen Hawking is really challenging. You should see the film and you’ll know how great Eddie Redmayne is. Anyway, I am not here to talk about Eddie Redmayne, I am here to talk about Benedict Cumberbatch and his film, The Imitation Game. So Benedict Cumberbatch played the role of Alan Turing who actually invented the first computer ever. He’s a clever man yet somehow lonely. It reminds me of another role that Cumberbatch played, which is Sherlock Holmes in Sherlock TV series. I think Benedict Cumberbatch really is suited for roles like that. Basically, Alan Turing was a hero yet he wasn’t recognised as one. He saved so many lives yet no one knew about it. Some scenes made me nearly cry because Cumberbatch surely animated his role really well and the story is so touching, yet at the same time, it is really exciting and very intriguing. The way he let out his emotion like that made me nearly cry. 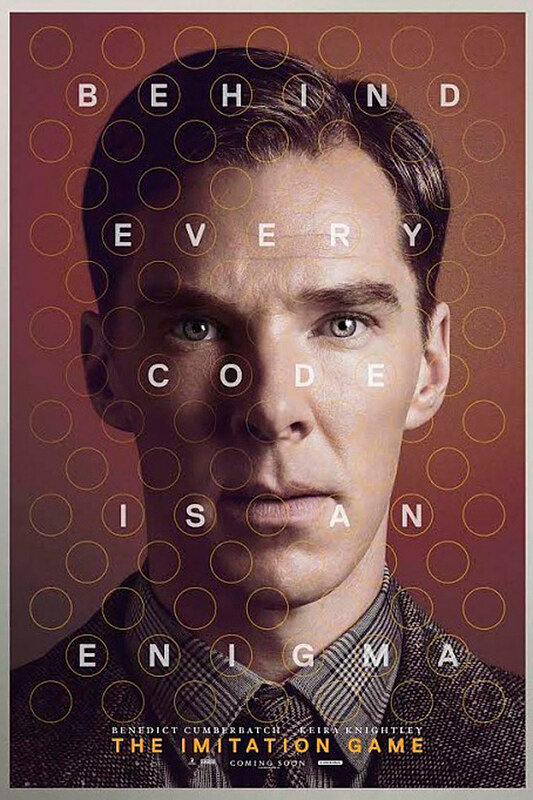 His usual characters weren’t that emotional, so this time, when I saw Cumberbatch cried as Alan Turing, it’s truly remarkable. I didn’t expect less from Benedict Cumberbatch because his acting is really good, even great indeed. His acting, his facial expression, even the way he brought himself as a genius person are all very good. Benedict Cumberbatch really has portrayed the character of Alan Turing perfectly. Aside from Benedict Cumberbatch, Keira Knightley also did a great job in this film. I am not a fan of her but she’s rather good in playing the character of Joan Clarke. With her classic look, Keira is also known for playing a character from past periods and she always looks good with it. This time is not an exception. She pulled off the character, the looks, the costume. Keira Knightley really did a great job. No wonder she’s nominated as Best Actress as well. Matthew Goode as Hugh Alexander also played his part well, not to mention he is very much good looking, giving his character more plus points. With his charming looks and intelligent character, Matthew Goode managed to embody his character perfectly. I haven’t watched any of his films before but in The Imitation Game, his performance is really great. Aside from Benedict Cumberbatch, I too like Matthew Goode in the film. Both the character and the actor himself. The setting, the equipment, the costume, everything is perfectly set. The production team has done a great job in designing them. I like how they managed to set the place perfectly, thus bringing us back to the age of World War II. Even the buildings and the costume in The Imitation looks great, really. I don’t know how they managed to build the machine but it looks great. It’s pretty interesting to see the first computer ever, seeing that now we can’t live without computer. Well, maybe we can but computer has become something that really is important nowadays. Anyway, it’s great that they managed to give us a look of the first computer and of course, the enigma machine as well. Everything is built perfectly. Aside from the story, a good setting place, equipment, and costume will make a great film become greater. And believe me, The Imitation Game has a very good story. It’s inspiring, truly. Now we all know the hero behind World War II. People should thank Alan Turing, truly. I am shocked that he wasn’t recognised as hero at first when all he did is saving many lives. The way the film delivered the story is really good and great. There are some funny moments and sad moments in the film. Everything is told perfectly great, touching, and most importantly, inspiring. However, I am confused in some parts because they took the scene backwards and forwards. Only until I watched it twice that I understand what was going on. It’s a small flaw, so not a big deal. It doesn’t change the fact that The Imitation Game is a great film. Making a machine like that—the first computer ever—in that kind of era where technology has gone to a minimum, Turing is really a genius mathematician and computer scientist. I get the moral lesson from this film, which is in order to do a greater good and save more people, sometimes sacrifices must be done. All the methods they have done in the past was just great. The Imitation Game is a film that can blow your mind. It’s a great film with great story, great actors and actresses. It is a complete package and I really like it. All in all, I really think The Imitation Game is worth to watch. No, actually it’s a must-watch film. It’s epic. It’s about time we know about Alan Turing. Without him, World War II will last longer and we wouldn’t have known the computer we have now. We really should thank Alan Turing. He’s a hero for all of us. I give The Imitation Game 9 out of 10 stars. Totally agree with you, this was a fantastic movie and almost totally unbelievable that this has been a true story. It was heartbreaking at the end, and Benedict Cumberbatch was absolutely wonderfull in this role.